From the Visualising Data blog here’s best of the visualization web for August and September. Download their paper on Using XDB Workflows to Analyze High Lift Drag Prediction Workshop Simulations. IL’s Steve Legensky describes how their focus on data management in FieldView is key to making CFD work for small and medium-sized business in this article from Digital Manufacturing Report. IL will be demonstrating their work with VisIt at SC13. IL has again been nominated for the IDC HPC Innovation Excellence award for their work on large data. Here’s a brief tech tip on getting EnSight running on OS X 10.9. Streamlines showing the effect of grid resolution on side body flow for the High Lift Prediction Workshop geometry. Image is a screen capture from the paper by Intelligent Light cited above. Congratulations to CFD Research Corporation for their sale of patented “lean burn” technology to Rolls Royce. Flow Science published the Fall 2013 issue of FLOW-3D News. If FEA can get you sued, can CFD? 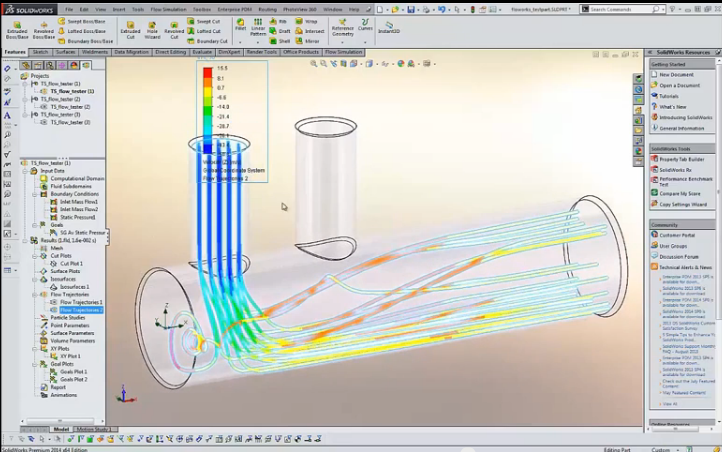 SolidWorks provides a video preview of Flow Simulation 2014. Screen capture from the video of SolidWorks Flow Simulation 2014 cited above. CEI (makers of EnSight) seeks to hire a Senior Software Developer. A CFD software company headquartered in Belgium is seeking to hire a Mesh Generation Scientist/Engineer. PADT has an opening for an Experienced CFD Analysis Engineer. Dr. Richard Korpus was appointed Chief Scientist for CFD at ABS. The average engineer’s salary is $92,900 per year. Only 57% of engineers receive health care benefits. Only 54% of engineers receive a 401(k). COOLFluiD 2013.9 was released. It is a collaborative simulation environment for multiphysics. Fire Dynamics Simulator FDS 6 was released. Simerics and CFTurbo have agreed to maintain interfaces between their respective software products. MSC Software released Marc 2013.1 with new capabilities for FEA of non-linear materials. It’s November and that means 2013 is virtually over. While some may take this opportunity to look forward to 2014, I’d like to look back at CFD in 2013: what will change? what will not on the CAE Watch blog published back on 31 Dec 2013. #1. Automated mesh: a classical fairy tale continues. Can’t argue with that. It’s the same old story. Literally, automated means “without human intervention.” I’m not aware of a mesher than can take any geometry file and generate a suitable mesh (one for which the CFD solution will converge to the right answer) without human intervention. Some would say they can do so given a clean CAD file which raises the issue that automation depends on when you start and stop counting. Some can say they can do so for a given application or even a given solver but automated meshing won’t help you if your solver doesn’t accept that particular type of meshing. But if we stop being literal and start being practical you can find advances in many different software tools that automated, streamline, and otherwise make faster the job of mesh generation. He used the “d” word. I won’t take the bait. All I’ll say here is that EXA’s stock price seems have doubled since April. I’ll address this one only because the turkey analogy makes me think of Thanksgiving. In my opinion, the issue with cloud computing is that it means different things to different people. Does it mean inexpensive? Fast? Automatic? Simple? The brave souls at the bleeding edge of this technology (Ciespace comes to mind) are going to have to do a lot of work, make a lot of mistakes and define the value proposition(s) for the rest of us. Oh, he went there. Back to being literal: a commodity is “a class of goods which is supplied without qualitative differentiation.” I doubt any high technology field like CFD will ever be commoditized. But that’s not the author meant. He mean cheap. CFD software is not cheap, like impulse buy cheap. However, you can get OpenFOAM for free and, from what I’ve seen it’s very capable especially in the right hands. Plus I’m told it’s the third most widely used CFD code on the planet. Aha, we get to the crux of the matter. “Of course, almost all vendors will continue to enjoy high profit margin.” Excuse me while I go to the loading dock: our daily dump truck full of cash has arrived. Seriously, you should read and think about all nine predictions. And maybe I should think about sticking my neck out and making predictions for 2014 instead riding someone else’s coat tails. Research and Markets published a forecast in which the global CAE market (which includes CFD) will experience a compound annual growth rate during the period 2012-2016 of 11.18%. [Accurate to two decimal places! It must be true!] That would make the market size US$3.4 billion in 2016. The same folks have a forecast just for the global CFD market in which it grows 13.33% over the same time period. No USD market size number provided. ANSYS had 2013 Q3 revenue of $212.7 million, an increase of 9% over the same period last year. This includes an operating profit margin of around 38%. They anticipate FY 2013 total revenue of around $860 million. 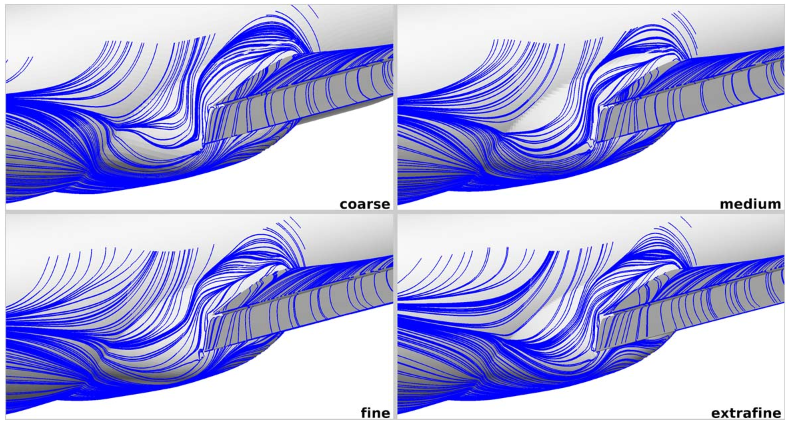 COOLFluiD LES simulation of subsonic turbulent flow over a wing with leading edge slat. This article from Desktop Engineering about Mentor Graphics‘ CFD software addresses many of the issues cited above. Also addressing one of the issues cited above is SpaceClaim’s announcement of cloud-based 3D model collaboration coming in 2014. 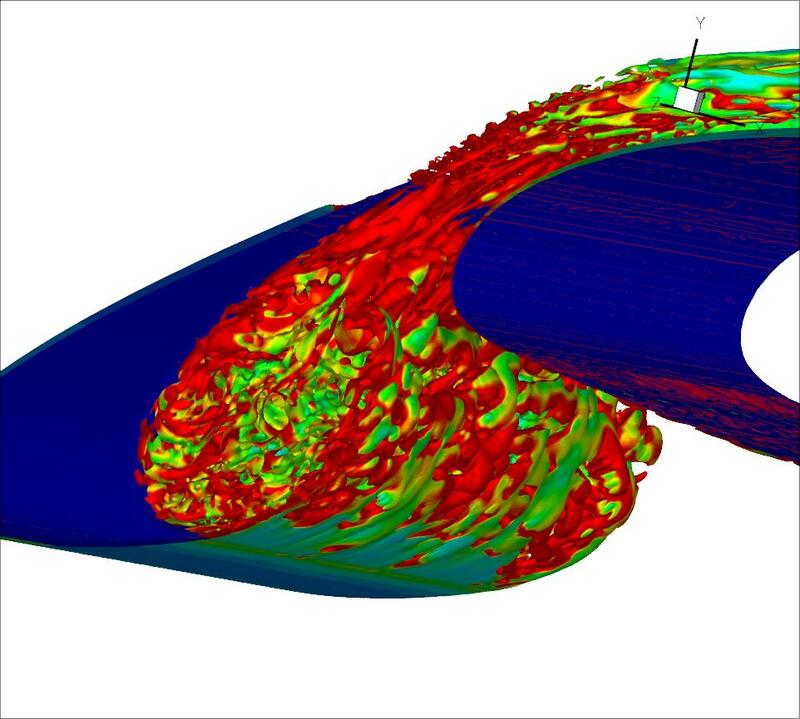 Altair has made available presentations from their Altair Technologies Conference including one about Cradle CFD software. Flow Science has opened the call for abstracts for the 14th FLOW-3D European Users Conference to be held 17-18 June 2014 in Vienna. Abstracts are due by 25 April. Symscape performed a CFD study comparing race car rear wing mounting techniques. 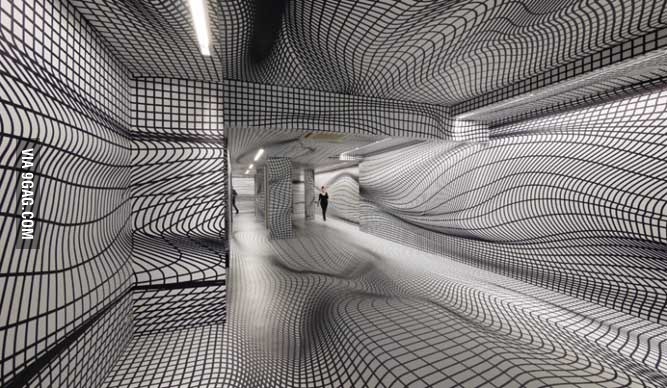 New paint job at Pointwise corporate headquarters? Image from 9GAG. This entry was posted in Applications, Events, News, People & Places, Software and tagged Altair, ANSYS, CFDRC, CFTurbo, Ciespace, COOLFluiD, EnSight, FDS, FIeldView, Flow Science, FLOW-3D, FRIENDSHIP-Framework, Intelligent Light, jobs, Marc, Mentor Graphics, MSC, Simerics, SolidWorks, SpaceClaim, Symscape. Bookmark the permalink.